Guest post by Man Mohan Munshi Ji. 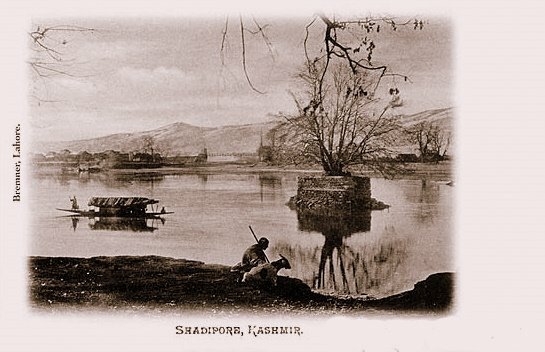 Towards the end I am adding an old photograph of the place and a bit about a Kashmiri proverb related to the place. The present Vitasta -Sindhu -Samgama the conflunce of Jhelum and Sind rivers at Naranbagh near Shadipur. 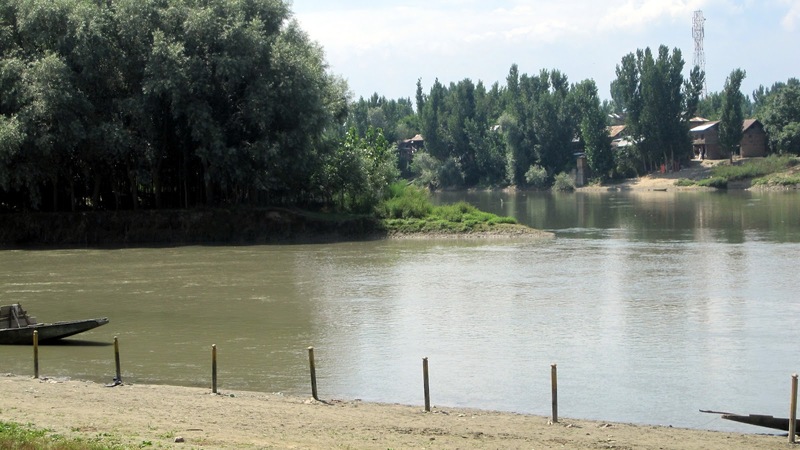 The river in the left foreground with greyish coloured water is the Sind river and the other with the bluish green coloured water in the right background is the Jhelum. 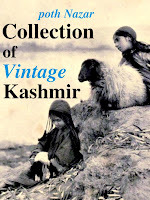 Suyya the able engineer of King Avantivarman by his skill shifted the position of Vitastasindhusamgama from Parihaspura Trigami area to its present location in the vicinity of Sundribhavana (Naran Bagh) by forcing the course of Vitasta north east wards by blocking its original course with embankments to reclaim the cultivable land from flood prone areas and marshes. A Vishnu temple by the name of Yogavasmin was also built by Suyya at the instance of Avantivarman. Preyaghuch buni nah thadan nah lokan nah badan. The chinar of preyag neither become taller, nor shorter, nor bigger. A poor sickly child, who does not grow or become fat. 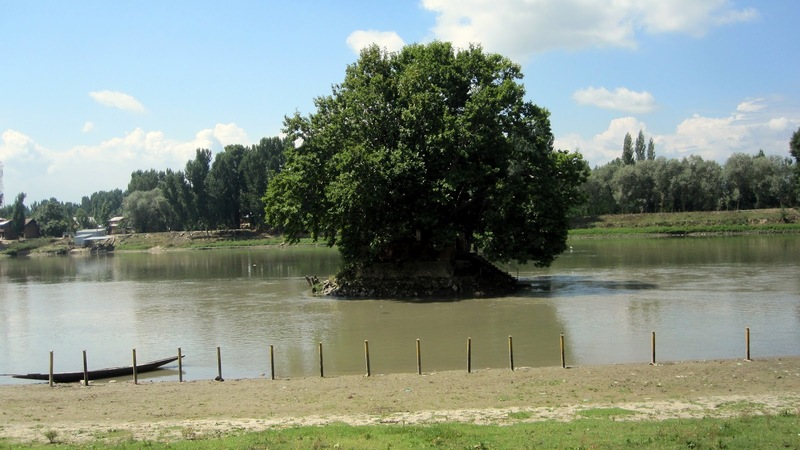 This chinar tree is in the middle of a little island just big enough to pitch your tent on, in the midst of the Jhelum river by the village Shadipur. The Hindus have consecrated the place, and a Brahman is to be seen twice every day paddling himself along in a little boat to the spot, to worship and to make his offerings. This chinar tree at Shadipur is believed to be the (sangam) confluence of rivers Indus (Sind) and Jhelum (Vitasta) and is called `Prayag' by Kashmiri pandits - alluding to Prayag that is Allahabad where Yamuna and Ganga meet up. 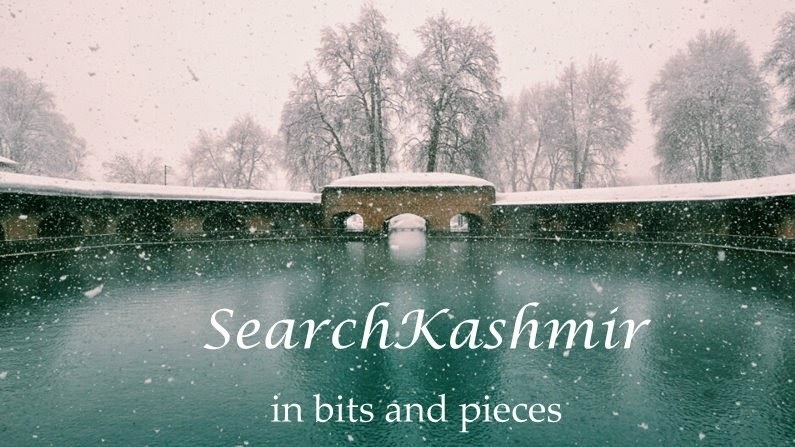 Kashmiri Pandits used to immerse the ashes and remains of their dead at this spot.